The occupation of Ninawa province by insurgents of the Islamic State of Iraq and Syria (ISIS) threatens nearby Iraqi archaeological sites. The ruins of the ancient Assyrian city of Nineveh lie in the northern suburbs of the embattled city of Mosul. To the south of Mosul are the ruins of Hatra, a World Heritage site. 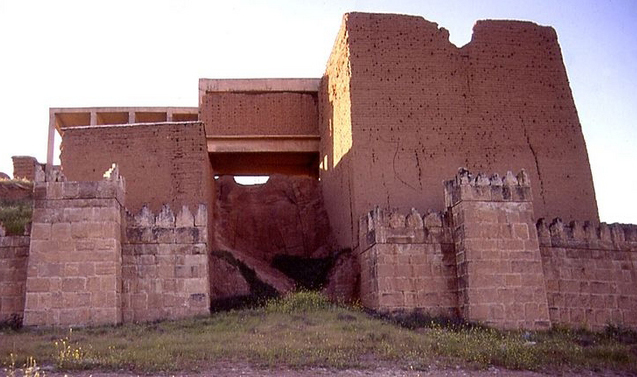 With the loss of government control in Ninawa province, these sites are threatened by looting. Looting has long plagued archaeological sites and museums in war-torn Iraq over the past 11 years. Nineveh’s ruins have recently suffered from illegal development and plundering. In 2010, the site was put on a list of endangered cultural heritage sites by the Global Heritage Fund due to looting and insufficient government management. In the lawless weeks after the fall of Saddam Hussein in 2003, both the National Museum in Baghdad and Mosul’s Archaeological Museum were plundered by looters who carried off thousands of priceless cuneiform tablets, sculptures, bronze tablets, books and other items. Many other irreplaceable artifacts were destroyed. Similar looting threatened the ruins of Hatra. At the site of the ancient Sumerian city of Umma in southern Iraq, looters dug hundreds of trenches and pits, turning the archaeological site into a moonscape. The actions of looters in Iraq during the war forced the United Nations to include a provision to UN Resolution 1483 (2003) calling on all member states to facilitate the return of Iraqi cultural artifacts that were illegally removed. According to the Global Heritage Fund’s 2010 report, “Saving Our Vanishing Heritage,” the worldwide trade in stolen antiquities is estimated to be in the billions of dollars, but local thieves receive only a small fraction of the stolen artifact’s worth. Most often, the stolen items end up in collections in Europe, North America and Japan. In 2008, Iraqi Security Forces raided a house in Basra and recovered 228 ancient Mesopotamian artifacts that had been plundered from archaeological sites and museums throughout the country. They had been operating on a tip that important Iraqi monuments were going to be smuggled from the country and enter the black market in order to fund insurgent groups. The objects have since been returned safely to the Iraqi National Museum. Despite these small successes, thousands of Iraqi cultural artifacts are still missing. Many of them can be viewed on Interpol’s database of stolen works of art, which tracks art and cultural heritage thefts worldwide. Criminologists are just beginning to understand how the black market in cultural antiquities works, despite all the legal safeguards put in place by governments and international agencies. A recent study published in the British Journal of Criminology presented empirical evidence, the first of its kind, of a statue trafficking network in Cambodia. The researchers found evidence of organized crime, that fakes were constructed and placed in the market at the same time the real items were sold, and that the time it took from theft to sale was very short. With the loss of government control in the region by the ISIS insurgents, and given the sad history of archaeological looting in Iraq, there is a very real possibility that the cultural heritage sites in northern Iraq will become threatened again.